Canvassing for alliance party candidate, DMDK's R Azhagarsamy, Palaniswami repeated his charge that Stalin was trying to "break" the AIADMK and "topple" the government. Tamil Nadu Chief Minister and top AIADMK leader K Palaniswami on Friday hit out at DMK President MK Stalin for his “negative campaign” targeting him and other NDA leaders, saying no welfare activities were taken up by the opposition party while in power. AIADMK is leading the National Democratic Alliance (NDA) in the state with its other constituents being BJP, DMDK and PMK among others, while DMK is heading the Secular Progressive Alliance (SPA) whose constituents include Congress and the Left parties. 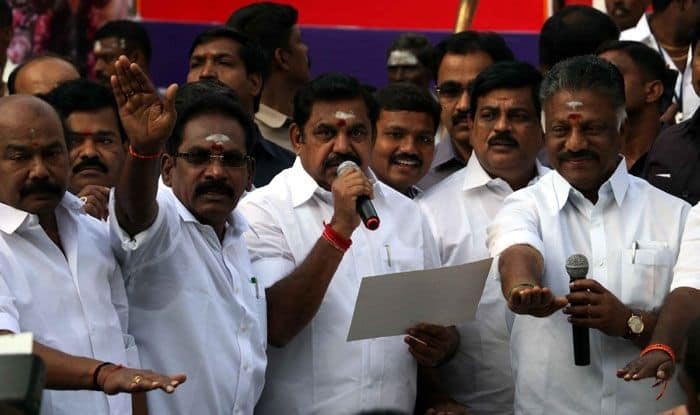 Canvassing for alliance party candidate, DMDK’s R Azhagarsamy, Palaniswami repeated his charge that Stalin was trying to “break” the AIADMK and “topple” the government. He reiterated his stand that the country required the “strong and determined” Prime Minister Narendra Modi to lead it for a successive term. “Stalin is not seeking votes by speaking about public projects but is only targeting me and leaders of our alliance parties. This is because they did not implement any welfare activities when they were in power,” he said. DMK last ruled the state between 2006 and 2011. It was also a key partner in the UPA I and II that governed the country from 2004 till 2014. Late DMK chief M Karunanidhi led the party out of the Congress-led alliance in 2013 over the Sri Lankan Tamils issue. He also sought to know Stalin’s response to the Income Tax sleuths recovering cash from the property of a DMK leader’s associate in Vellore. I-T officials had seized Rs 11.53 crore cash from a cement godown on Monday. Palaniswami alleged Stalin was trying to win over the voters by bribing them, but said it will not happen. “He is repeatedly trying to break the AIADMK and topple the government. This party is a massive cadre-based one. None can harm it,” he said. Taking a swipe at MDMK founder Vaiko for joining the SPA, Palaniswami recalled the former had earlier said DMK was a company and not a party at all. “Vaiko had earlier said Stalin was unfit to become even a (municipal) councillor but is now backing him for the post of chief minister,” the AIADMK joint coordinator said. Batting for “like-minded” parties ruling both at the Centre and the state (BJP and AIADMK), he said this will help in the ensuring adequate funds for developmental activities. Election to 39 Lok Sabha constituencies in Tamil Nadu is scheduled on April 18.